The building was designed for Grace Brothers of New York, and completed in 1928. The drawings were prepared by James W.O’Connor, an American architect, who was assisted on site by a London surveyor. In 1963 the banking hall was completely refitted, for the Bank of China, leaving none of the original screens or furniture. 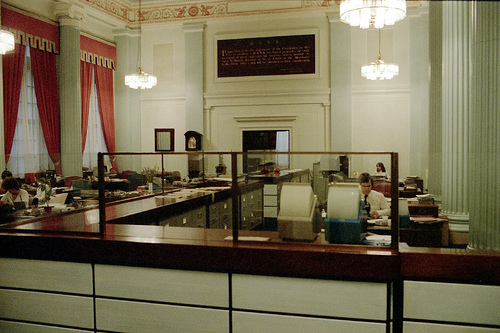 In 1998 Patrick was commissioned to carry out an examination of the painted schemes applied to teh surfaces of the old banking hall. Patrick found that the banking hall had been decorated on five occasions. 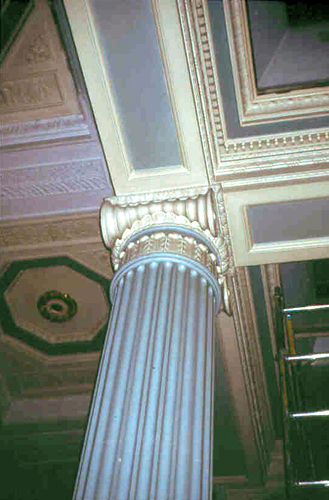 When the area was first painted, the general effect was of a near monochromatic space, with an overall cream colour , broken only by paler columns and pilasters. It was a number of years before the Hall was painted again. The first scheme to be applied was an oil paint made up on a white lead base. This was followed by three schemes of what appears to have been oil-bound water paint or early emulsion paint, the first in a cream colour, the later ones in paler stone colours. The fourth scheme, which probably dated from 1969, saw the introduction of colour on certain elements, and wallpaper on the beds of the wall panels. It was only when the fifth decorative scheme was applied that gilding was adopted on the ceiling, and coloured glazes were used on the frieze. 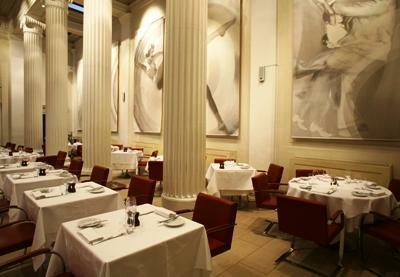 The building was converted into a restaurant and it is now known as Prism London. I am the head receptionist at Prism and am trying to collect some information on the the building. Your information above is very useful. Do you have anything additional? Thanks for getting in touch Sarah. I carried out the work in 1998, before I ‘became digital’, so my report doesn’t have integrated illustrations. However, I can send you the text of my report if it would help. That would be fantastic. Thank you so much for your help.